L’Exposition de Paris de 1889 was published in 40 issues between 15 October 1888 and 2 October 1889. It documents in detail the preparations for and course of the Exposition Universelle held in Paris between May and October 1889. The journal is an invaluable record of one of the most important cultural events in France during the nineteenth century. 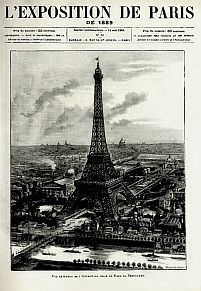 It is illustrated extensively with photo engravings and contains numerous reports on every aspect of the Exposition, notably the construction of the Eiffel Tower, the abiding symbol of the Fair.